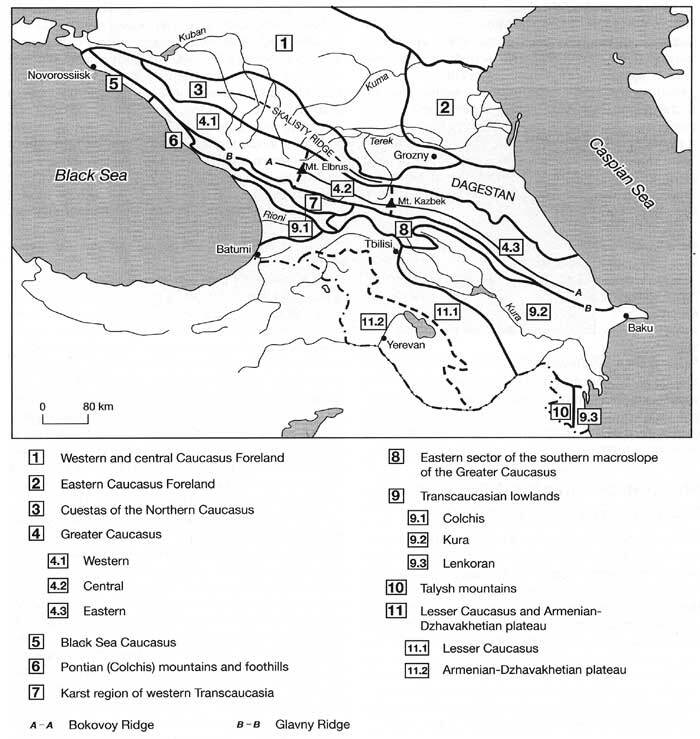 The main physical geographical regions of the Caucasus and Transcaucasia are shown in Figure 15.1. These include the cuesta region of the Greater Caucasus, Dagestan, the Greater Caucasus, the Black Sea, and the Pontian Caucasus, the southern macroslope of the Greater Caucasus, lowlands separating the Greater and the Lesser Caucasus, the Lesser Caucasus and the Armenian-Dzhavakhetian plateau. The cuesta region of the Greater Caucasus consists of three ridges with steep southern or south-western and gentle north-eastern slopes running parallel to the Glavny Ridge: Lesisty (absolute heights 800-1000 m), Pastbishny (1200-1500 m), and Skalisty (1500-3600 m). The formation of the cuestas is linked to the differential weathering of sandstones, limestones, marls, and clays of which the area is composed. The valleys of the Kuban, Kuma, and Terek rivers divide the cuestas into massifs which also have an asymmetrical shape: the western slope has a character of gently sloping plateaux while the eastern slope is very steep. Skalisty Ridge, which received its name (meaning 'rocky') from its steep southern slope, has local elevations of 300-400 m. Extending across the Caucasus, it plays an important part in the formation of regional climates. The northern slopes of the cuestas (especially the Skalisty Ridge which is the highest) receive abundant precipitation while the valleys, extending between them, and regions, located in the rainshadow, have much drier environments. Melt water and abundant precipitation on the northern slopes, combining with limestone and other calcareous rocks, predetermines the widespread development of karst. Karst landforms include sinking streams, caves, and depressions developing on the surface. The latter often exceed 100 m in depth and 200 m in diameter. Karst plays an important role in the formation and supply of aquifers. Surface water sinks through the limestone until it reaches impermeable clay and marl strata where below ground reservoirs or streams develop. The water then emerges under substantial pressure forming numerous springs in the foothills and in the highest eastern sector of the Skalisty Ridge springs also occur in the mountainous areas (Gigineishvili, 1979). Lake Cherik-Kel in the Cherek valley, which has a depth of 254 m and is one of the deepest lakes in Russia, is nourished by such springs (Gigineishvili et al., 1983). Located in the eastern Caucasus, Dagestan can be subdivided into the north-western mountainous region, inner Dagestan, and the eastern foothills. North-western Dagestan includes the eastern part of the Skalisty Ridge with altitudes exceeding 3000 m, and lower chains extending along the Skalisty. The mountains intercept moisture from the Caspian and the Eastern European plain and their northern and north-eastern slopes receive 800-900 mm of precipitation per annum while the adjacent plains receive 400-500 mm. Similarly, the eastern foothills and slopes receive more moisture from the Caspian than the coastal regions occupied by semi-deserts. The original mountainous vegetation in north-western and eastern Dagestan is deciduous forests and meadows but it has been bly altered by human activities. As in the cuesta region, karst is well developed and there are numerous springs and lakes of karst origin. Inner Dagestan is a mountainous region with plateaux and ridges reaching an altitude of 2000-2700 m and valleys positioned at 600-700 m. Surrounded by high mountains on all sides, it has a distinctly arid climate. At an altitude of 1000 m, annual precipitation is about 500 mm, while evaporation is twice as high (Gigineishvili, 1979). Geomorphology and exogenic processes are different from those in the other parts of Dagestan (e.g., the development of karst is very limited) and vegetation is dominated by xerophilous communities. The Greater Caucasus is subdivided into western, central, and eastern sectors with the borders corresponding to the highest summits, the Elbrus and the Kazbek. In the west, it is flanked by the Black Sea Caucasus whose altitudes increase from 500-1000 m in the west to 3000 m in the east. On the eastern flank, altitudes decline eastwards towards the Caspian from about 3000 m to 500 m. The main ridges of the Greater Caucasus are the Glavny (also known as Vodorazdelny) and the Bokovoy Ridges where the tallest summits, six of which exceed 5000 m, are located. The Greater Caucasus forms the major climatic and environmental divide. High altitudes and abundant precipitation provide for the development of modern glaciation which is discussed on below. 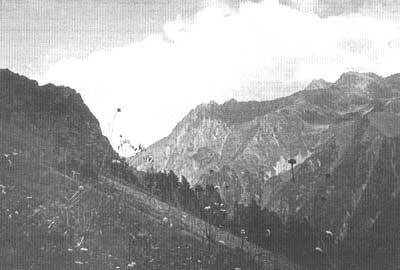 Tectonic uplift, recent volcanic activity, Quaternary and modern glaciations and active exogenic processes have given the Greater Caucasus its characteristic alpine landscape (Plate 15.1). It is bly dissected with a multiplicity of erosional and glacial landforms. Altitudinal zonality in the distribution of vegetation is well developed and discussed on below. In brief, in the western sector of the Greater Caucasus, which has large absolute heights and a mild and humid climate, mountainous forests, and meadows are widespread. The mountains are mainly composed of crystalline rocks and the rates of weathering and erosion are comparatively low. In the central sector, which has the highest elevations and, consequently a cool and humid climate, meadow ecosystems are most widespread (these become more xerophilous in the landlocked Elbrus region) as well as nival environments. It is the most widely glaciated area in the Caucasus and glacial landforms determine the landscape of the high mountains. In the eastern sector, lower altitudes predetermine a lesser extent of modern glaciation and as aridity increases, xerophilous environments become more widespread. The region is composed mainly of shales that weather relatively easily. The weathering and erosion rates are very high and ancient glacial forms have largely been eroded. The Black Sea Caucasus extends along the Black Sea coast as a system of ridges with altitudes of 500-700 m whose height increases eastwards to the maximum altitude of 2900 m. These are composed mainly of marl flysch and limestone but because of low humidity, weathering rates are low. Climatic conditions and river regimes resemble those of the Mediterranean and xerophilous vegetation dominates the area. The Pontian or Colchis mountainous region extends further east of the Black Sea Caucasus. The division is based on climatic differences: the Pontian Caucasus receives much more precipitation and has a very humid climate. Under the conditions of high humidity, flysch, marls, and clays, which compose much of the region, are easily eroded and hills have relatively low altitudes and gentle, rolling forms. These alternate with mountainous chains with the southeastern strike. The mountains, built of limestone, are cut by narrow river valleys and karst is widespread. The Gagra and Bzyby Ridges, the southern spurs of the Kondor, Svanety, and Megrel Ridges, the Rachinsky Ridge and the Askhi plateau form the so-called karst region of western Transcaucasia. The large spatial and vertical extent of limestone (limestone strata exceed 2200 m in thickness) and abundant precipitation (in the western part of the region, slopes receive 1500-2500 mm a-1 at an altitude of 1500 m) predetermine the ubiquitous development of karst at all altitudes. The full range of karst landforms occurs in the region. At lower altitudes, caves reaching 5 km in length, shafts exceeding 200 m in depth, and sinking streams are typical, while karren landscapes develop in the mountains. High mountains are virtually devoid of surface runoff as water sinks through the limestone while in the lower mountains, karst springs with high (up to 10 m3s-1) water discharges develop (Gigineishvili, 1979). Karst landforms are often superimposed on the glacial landforms created by the Pleistocene ice. Relict karst is widespread too. Deep karst cavities developed in the Jurassic limestones are overlain by the Eocene clays, testifying to the long history of karst formation in the region which dates back to the Jurassic (Gvozdetsky, 1992). The large amount of calcium in the soil predetermines the development of specific habitats which are drier than can be expected in this climate and accommodate various calcicole species that are not found elsewhere. Thus, in the subalpine and alpine meadow altitudinal belts, 33 per cent of species are endemic (Gvozdetsky, 1954). Soil cover is thin, the profiles are poorly developed and contain large amount of rock debris. As a result, vegetation cover is often sparse. It is easily destroyed by extensive grazing and widespread erosion follows. The southern macroslope of the eastern Greater Caucasus comprises highlands and ridges of predominantly medium (about 2000 m) height: the highlands of Imeretia, the Surami Ridge, and the mountains of Southern Ossetia, Karthalinia, and Kakhetia. The ridges, which have a meridional strike, lead away from the Glavny Ridge with the altitudes declining southwards. Protected by the Greater Caucasus from the north, this region has a mild climate which becomes progressively more arid eastwards as annual precipitation totals decline from 1500 mm in the west to 600 mm in the east. There are three main lowlands in the Caucasus: the Colchis, Kura, and Lenkoran. The Colchis lowland (also known as Kolkhida or Rioni) and the Kura lowland, divided by the transverse Surami Ridge, comprise the Rioni-Kura tectonic depression. The Colchis lowland is a young accumulative plain formed during the Pliocene-Quaternary when the whole region experienced uplift. The Miocene marine basin, which existed in its place, was filled by sediments whose thickness reaches 700 m. At present, the Colchis lowland subsides at a rate of 0.6 cm a-1 (Gornye strany, 1974). However, a number of rivers, beginning in the Glavny Ridge and the mountains of Adzharia and Imeretia, drain the Colchis lowland delivering and depositing a vast amount of alluvium at a rate exceeding 100 million m3a-1 to the coast and beyond. The Rioni is the largest river with a length of over 300 km and a vast, 20-30 km wide, delta. The sediment discharge by the Rioni is particularly high and intense accumulation occurs in its estuary, filling the delta and extending the coastline (Tushinsky and Davydova, 1976). Coastal dynamics are extremely complex in the Colchis lowland and while in some areas the net result is the expansion of land, in other regions the coastline retreats despite the high sediment delivery. One of the reasons for the retreat is the occurrence of numerous submarine canyons in which alluvium is deposited (Zenkevich, 1990). The Colchis lowland has a flat topography with altitudes gently increasing landwards. It comprises relict river deltas and river-mouth bars and ramps, and relict alluvial deposits. Originally, much of the lowland was swampy and, although extensive improvements have been made, swamps still occupy large areas. The warm and moist climate of the Colchis lowland preconditions the development of lush vegetation containing many relict species. Having survived from the Tertiary, the vegetation in the foothills is especially rich floristically while on the lowland itself, plant communities are less diverse because of the lowland's young age. Little of the climax vegetation survived on the Colchis lowland with the exception of riparian forests because it is a major agricultural region growing tea, grapes, and citrus fruits. These and many other species were introduced in the 19th century and at present agricultural ecosystems dominate. Of introduced plants, eucalyptus, used in amelioration projects, is particularly widespread. The Kura (or Kura-Araks) lowland extends between the Surami Ridge and the Caspian Sea. Absolute altitudes decline from the west (450 m above sea level) to the east where the delta of the Kura is located 25 m below mean sea level. The lowland is composed of marine sediments in the east, deposited during the Quaternary transgressions of the Caspian, and alluvium delivered by the Kura and the Araks. Protected by the Greater Caucasus from the north and the Surami and Likhvin Ridges from the west, the Kura lowland has a dry climate with 200-400 mm precipitation per annum. Semi-deserts and sparse arid woodlands represent the zonal vegetation. The ground water table is close to the surface and topographic depressions are often swampy. Wetland vegetation communities, developing in such habitats, are represented largely by Phragmites communis and Bolboschoenus maritimus while riparian forests develop along the Kura and the Araks. The Lenkoran lowland is located south of the Kura lowland, extending between the eastern foothills of the Talysh and the Caspian. It has a very warm and moist climate with annual precipitation totals exceeding 1200 mm. Climax vegetation communities comprise many Tertiary species but natural forests have been largely destroyed and replaced by agricultural ecosystems. Natural ecosystems are preserved in coastal wetlands, which are widespread in Lenkoran, and in nature reserves. The mountainous regions of the Lesser Caucasus and the Armenian-Dzhavakhetian plateau are located south of the Rioni-Kura depression. The Lesser Caucasus consists of a system of mountainous ridges with altitudes of 2000-2800 m in the west and 2500-3300 m in the east. The Armenian-Dzhavakhetian plateau comprises volcanic plateau composed of tuffs, basaltic and andesitic lavas with absolute heights of 600-1500 m, mountainous massifs rising to 2500-3000 m, and volcanic cones exceeding 4000 m. The two highest summits, Ararat (5165 m) and Aragats (4095 m) are volcanic cones carrying ice caps. Both are considered inactive although minor eruptions of the Aragats occurred in early historical times (Nalivkin, 1973). The potassium-argon dates, obtained by Mitchell and Westaway (1999), suggest that Quaternary volcanism began in the Lesser Caucasus and the Armenian-Dzhavakhetian plateau before 1.1 Ma BP, and reached its peak around 0.8 Ma BP. The climate of the region is arid with a high degree of continentality. The lack of precipitation and the high permeability of volcanic rocks lead to meagre surface runoff and the development of xerophilous vegetation communities, many of which have been altered over the centuries of human activity.